After my last failure to get a proper cure in my SLA printed masters, I reached out to my local distributor and Smooth-On to see if they had any recommendations for improving the quality of the curing. It turns out photopolymer resin is fundamentally incompatible with platinum silicone curing, and while this can be mitigated to some degree by the finishing process (especially heat treatment), a boundary layer of uncured silicone is still present where the mold comes into contact with the master. 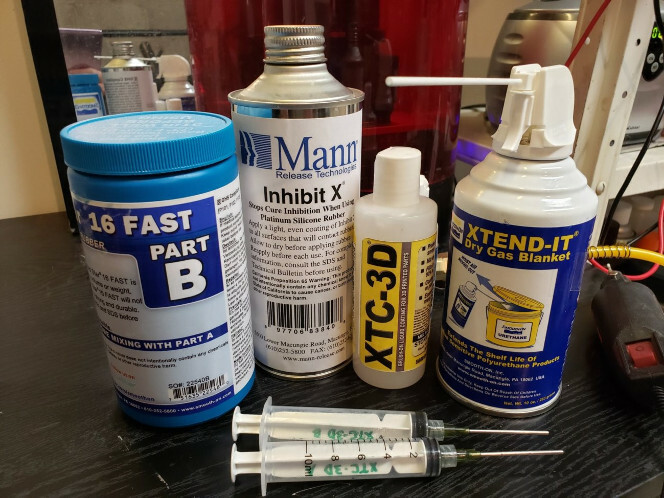 The technical staff at Smooth-On were very helpful in explaining that they normally don’t recommend using platinum cure silicones in SLA prints, but that if I insisted, I should try their products Inhibit X and XTC-3D. I’m afraid I had to insist! Inhibit X (MSDS) is a very thin, clear liquid with copious flammability and explosiveness warnings that brushes onto the SLA part, insulating it from the curing silicone. It applies very smoothly and retains a very surprising amount of detail, leaving even small imperfections like the print striations clearly visible in the finished part. It should not appreciably change the shape of anything, so it’s very good for molding. You apply it liberally in at least two coats, allow time to dry, and then cover with Mann Ease Release if you’d like. It’s not the cheapest chemical, but you absolutely get what you pay for. After performing my finishing process from part 1 and applying only Inhibit X to test, my molds cured to a very nearly usable state. To make the molds work even better, I then added XTC-3D (MSDS) to the process, applying it before the Inhibit X. This is a very inexpensive, clear two-part substance that you mix together and then coat onto the part. It is self-leveling and provides a very pleasant visual finish once dry, smoothing out any striations and imperfections. It has the added benefit of providing additional insulation against cure failures, allowing Inhibit X to really do its work. You can also create some pretty awesome stuff by mixing colors and metal powders into the XTC-3D for some very impressive part finishes on your other prints. 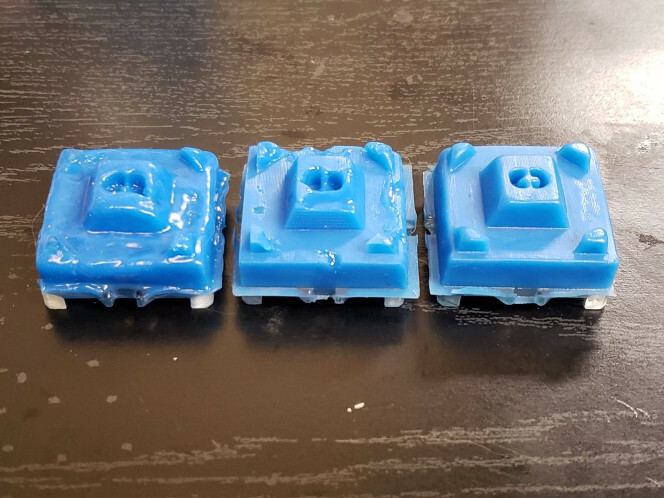 While I don’t necessarily care about striations on my mold since the areas where the silicone contacts the SLA part are not essential to the shape, the XTC-3D is cheap enough that the added layer of protection is a very straightforward choice. While it does change the shape and tolerances of your master slightly, you can generally apply it in a thin enough coat for it not to be a problem, or you can thin the solution further with Epic Epoxy Thinner (MSDS). I like to blast any fine details with an air gun while the thinned XTC-3D tacks to ensure there’s no buildup in small corners. Another way to beat silicone’s reluctance to cure in the prints is with a much faster cure. 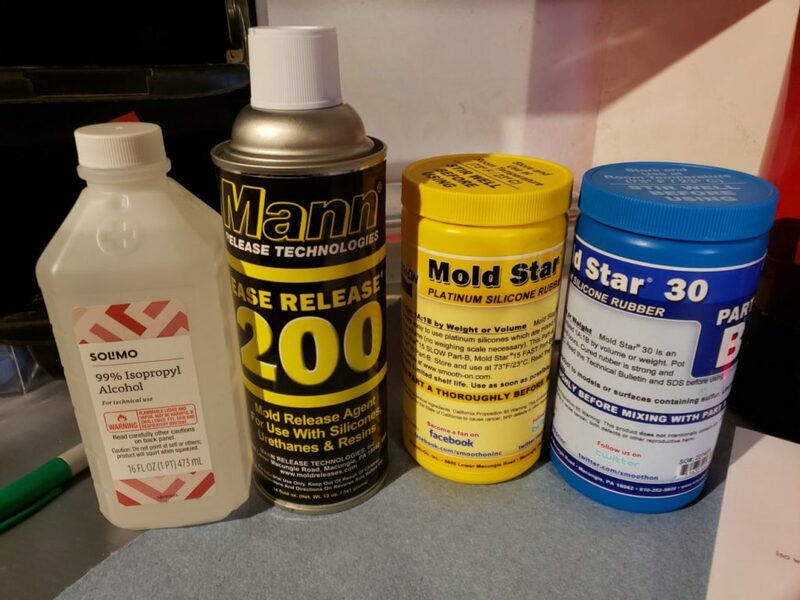 Mold Star 30 (MSDS) takes 6 hours to cure, but if you’re willing to sacrifice pot life, Mold Star 16 FAST (MSDS) only takes 30 minutes and seems to work better in general with SLA prints. I am extremely satisfied with the results. To cure even faster, you can hold the temperature a little higher during the curing process. 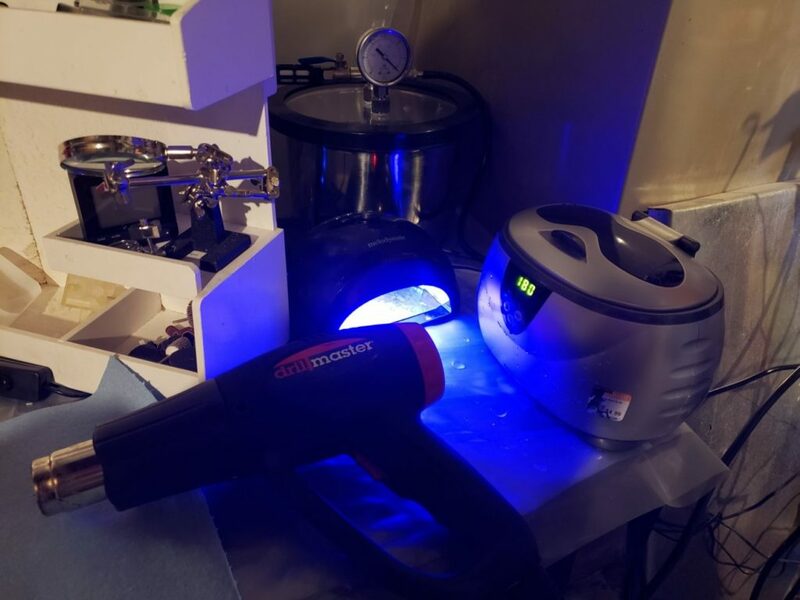 Higher temperatures significantly reduce the pot life and cure time of platinum cure silicones, so I like to vacuum degass and pour my silicone at room temperature but then place the masters into the toaster oven under gentle heat to really expedite the process and ensure a great cure. This process turns out a great mold every time with ELEGOO translucent resin on my SparkMaker SLA printer. I’ll now be moving on to pressure casting finished parts in these, which I’m sure will present plenty of new challenges and solutions. Update: See Part 2 of this series for a repeatable procedure to make great molds in SLA masters. SLA (stereolithography) printers are excellent for creating finely detailed parts with beautiful finishes. 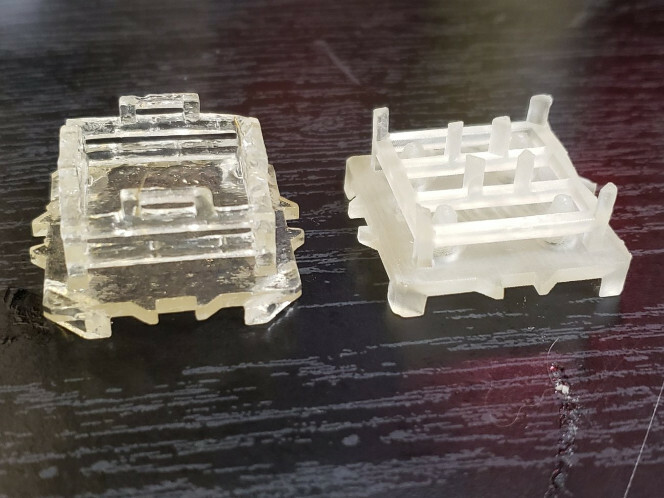 Their detail and ability to create complex shapes without the extensive support required on FDM printers make them theoretically ideal for creating masters for silicone molds, which in turn would allow them to create extremely high quality parts. SLA printers were once out of reach of the average consumer, but may now be purchased for as little as a few hundred dollars. There is a caveat, though: The materials needed to create a finished mold can be complicated and may have unexpected reactions with each other. Many stages of the process can cause curing failure in the silicone, resulting in a goopy mess instead of a professional mold. Even something as simple as wearing latex gloves instead of vinyl can cause your mold to fail. I recently purchased a SparkMaker SLA printer and some Smooth-On Mold Star 30 to make molds for a new project, but immediately ran into curing issues when the silicone was added. Even days of curing time wouldn’t produce a finished mold. Something was wrong with the resin, the silicone, or the finishing procedure. Since the finish was something I could easily control, I decided to print identical objects, perform a wide range of finishes, and cure the same batch of silicone in all of them. To this end I outlined 24 different finishing procedures of varying practicality in order to collect data on exactly how an SLA print should be processed when it will be used with molding silicone. Not all of them seemed sensible, but taken together would demonstrate why silicone can fail to cure in SLA prints, assuming the problem was with the finishing procedure. These tools and materials can be nasty. Always wear your PPE. 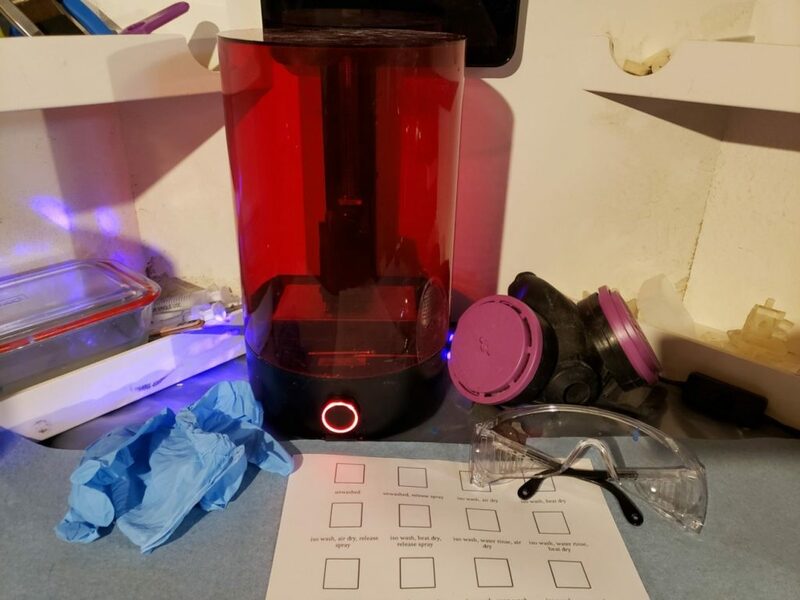 Parts made on many SLA printers are in what’s called a “green state” when they leave the printer bed, and are routinely washed, dried, and given a second UV cure before use. Traditionally this wash is done with isopropyl alcohol, as it works very well to break down any uncured resin on the green part. My theory at this stage was that small amounts of isopropyl alcohol were inhibiting the cure. 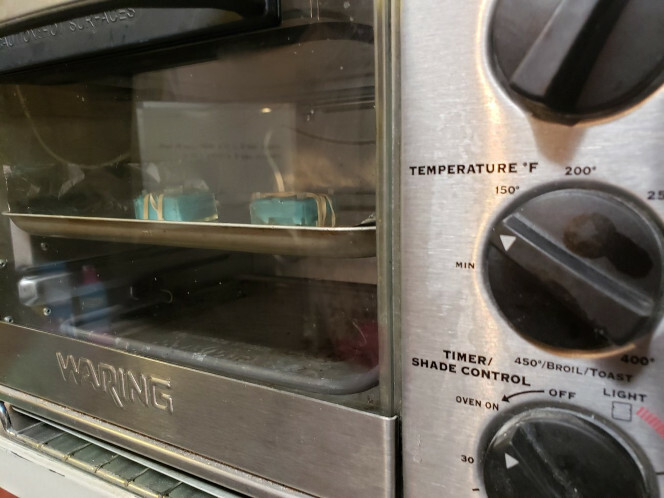 The anti-contamination procedures you would expect were used: One soap bath, for example, only contained pieces previously washed in isopropyl alcohol, and a fresh soap bath was made for pieces that had not contacted alcohol, etc. Each bath occurred in the ultrasonic cleaner for exactly three minutes. Each piece was patted dry with a fresh paper towel after all its baths were complete and before having heat applied or being left to air dry. Heat treated parts were placed in a box and warmed for approximately five minutes with a heat gun, at which time they appeared completely dry and slightly yellowed (most developed cosmetic fractures). All pieces, even those that were heat dried, were allowed to sit for three hours before any release agent was applied, at which point all pieces sat for an additional thirty minutes. Some of the finishes vary only slightly, so significantly different results were not expected for each. Each finish step was chosen to test a particular idea; however, all combinations of steps were used regardless of whether they made sense for extra data points and sanity checks. Isopropyl alcohol was used because it breaks down uncured photopolymer resin, which might inhibit the silicone cure. Soap was used as a general cleaning agent and potential alternative to isopropyl alcohol. 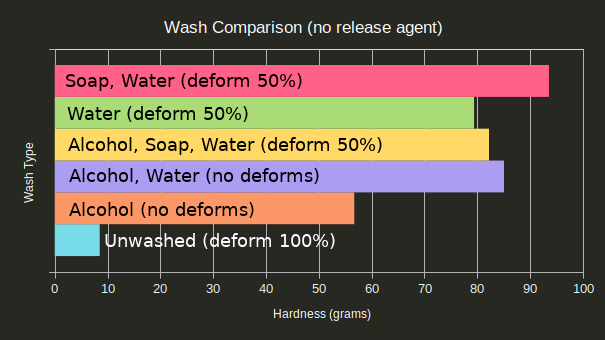 Water was used to clean off the residual soap and/or dilute any isopropyl alcohol or uncured resin. Heat was used to see if there was any difference in the evaporation of alcohol and moisture off the part (more on that to come). Release agent was used to see if it would insulate the part from the mold regardless of the finish’s residuals. After mixing the silicone parts in the recommended 1:1 ratio, I added 2ml of silicone to each cup and waited for the recommended cure time of six hours. Unfortunately my workbench area dropped about ten degrees Fahrenheit colder than the recommended curing temperature of 73 during this time, so that could have inhibited some of the curing process. Upon checking the parts clear differences were evident, but none had fully cured including the control in the mixing cup. I waited three more hours, at which point curing was still not complete (some would never complete–tested anyway), but many were ready for a hardness test. To test the cures, I sandwiched a popsicle stick between two pennies and glued the point of a toothpick to the bottom. This allowed me to hold the instrument in position while applying minimal force to the surface of the silicone. I then stacked quarters on top of the pennies until the toothpick was fully depressed into the silicone, since quarters have a known weight. The number of quarters needed to fully depress the point provides some evidence of how thoroughly the silicone had cured, more quarters indicating a better cure. The best cure has the maximum hardness and does not deform from the mold. I am defining deforming as silicone being pushed over the lip of the mold, or up to touch the penny before the toothpick was fully depressed. Unwashed parts are clearly the worst and resulted in goopy molds that never cured, even a day later. Washing only in isopropyl alcohol also didn’t result in as good of hardness as expected, though it did have a lower chance to deform under pressure. 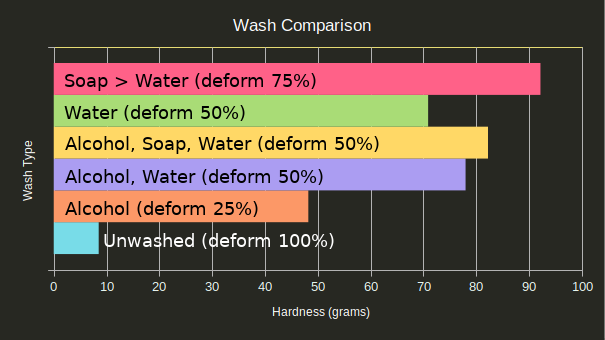 Soap and water resulted in the best hardness, but also had a high rate of deformation.  The ideal wash procedure seems to be an isopropyl alcohol bath followed by a water bath to dilute any residual isopropyl alcohol. Air drying vs. heat drying was the unexpected star of the show. Regardless of finish process, heat treating the part always resulted in a significantly better cure and lower chance of deformation. The heat seems to be curing the parts in some way the UV is not, and this cure in turn allows the silicone to cure. This was supported by tests #23 and #24 in which the parts were UV cured 10x as long as tests #1 and #2: The over-cured parts performed only marginally better than normally-cured parts (withstanding one quarter instead of none, and four quarters instead of two respectively), and both were still goopy after 24 hours. Perhaps the biggest takeaway from this post is that you should get in your car, go to a thrift store, and buy a toaster oven to go with your SLA printer if you intend to mold anything. 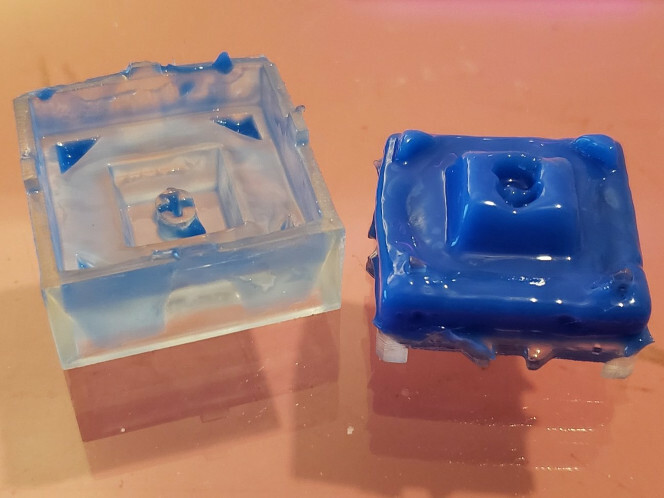 Release agent should be used when molding silicone against silicone; however, would it improve the quality of the mold if sprayed onto the SLA parts? Spraying release agent directly onto your SLA masters doubles the chances of deformation, though it does not significantly reduce the hardness of the material. 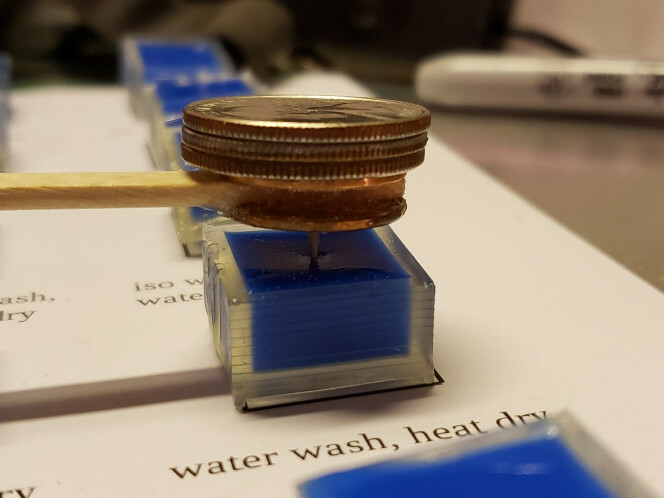 This was likely due to the mold being able to lift off of the master during testing and reach up to touch the penny. As force was added to the center of the mold, the sides were free to move and assume a new shape. The actual hardness of the material is likely identical, though masters without release agent achieved higher measured hardness since the master was able to act as a scaffold for the silicone and resist some force. In other words, Mann 200 works as intended: If you want your silicone to come out of your printed part, use it; if not, don’t. It has no clear effect on the curing process. Unfortunately, even with the better curing achieved with these processes, the silicone still fails to cure at the boundary between it and the part. Using the recommendations here do reduce the size of that boundary considerably, but will not result in the kind of mold you’re looking for. Any fine details will be lost, and there will be a goopy layer. Even such a layer only a few microns deep will result in an unusable mold, so something else will need to be done. Better than it looks, I swear–there’s a matrix of support material all through the silicone on the right to hold it to the positioner, so this silicone had its work cut out. All in all, this was a fun foray into workbench science and has given me a new area to investigate: What can you coat the master in to properly insulate the curing silicone from it while retaining very fine details, and how long should you heat treat a part and at what temperature for the best possible compatibility? More on that to come, as I did buy a toaster oven.